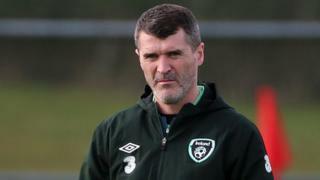 A grandmother, who footballer Stephen Ireland claimed was dead to get out of playing, has urged Roy Keane to help him return to playing for his country. Ireland has not played for the Republic of Ireland since September 2007, when he pulled out of the squad claiming his maternal grandmother had died. When the media discovered she was still alive, Ireland changed his story and said his paternal grandmother had died. But this was also untrue, and Ireland later apologised for his false claims. At the time, Ireland said he had made up the story because his girlfriend had suffered a miscarriage and he wanted to go home to see her immediately. On Wednesday, one of Ireland's grandmothers met Roy Keane on a flight to his native County Cork. She asked Keane to consider recalling her grandson for international duty. Keane was appointed as assistant coach of the Republic of Ireland international team last November, as Martin O'Neill took over as manager. The Corkman spoke about the in-flight encounter on stage at University College Cork on Wednesday night. He was in his home city to attend a public event and took part in a question and answer session. "Well, I spoke with the grandmother this morning - she was on the flight coming over - and she asked me would he get back involved," Keane told the audience. "I couldn't lie to her. I said he'd have a chance if he's playing well. I think Martin had a conversation with him, and all that needs to fall into place. "We all know how talented Stephen is and Martin will look at that. We wouldn't be shutting the door on any player. "What is important for any player, and Stephen is the same, is it does help to be playing week-in week-out. "He's obviously had a difficult spell. He's only just got a run of games at Stoke now. So I certainly wouldn't be ruling anyone out," Keane said, according to the Irish Independent. The incident, which has been dubbed 'grannygate' happened before the Republic of Ireland's Euro 2008 qualifier against the Czech Republic in September 2007. At the time, Ireland said he thought the Irish team's management would be more likely to grant him compassionate leave if they believed his grandmother had died. The Football Association of Ireland (FAI) hired a private jet to fly him home. In a statement dated September 2007, Ireland said his false death claims were a "massive mistake on my part" offered his "profound apologies" to his family and the FAI. The 27-year-old currently plays for English club Stoke City. In November 2009, he ruled out a return to the national team, saying he had never enjoyed playing for the Republic of Ireland, adding: "No manager would sway my decision now." But last September, two months before O'Neill and Keane were appointed, Ireland said he would "like to have a chat" when a new international manager was in place. Last month, Martin O'Neill indicated that he planned to meet Ireland in person in the coming weeks to hold talks.